Watch this video to learn how to make a quick-and-easy cream cheese chicken dish! 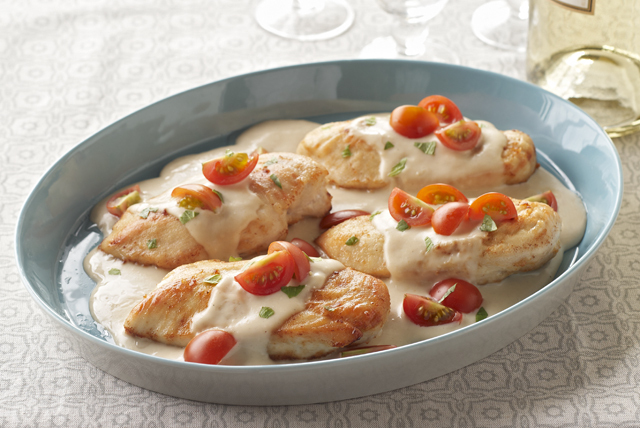 Learn more about this Chicken in Creamy Pan Sauce recipe today. Coat chicken with flour. Heat oil in large skillet on medium heat. Add chicken; cook 5 to 6 min. on each side or until done (165°F). Remove chicken from skillet, reserving drippings in skillet. Cover chicken to keep warm. Add broth to skillet; stir to scrape up browned bits from bottom of skillet. Add cream cheese; cook 2 to 3 min. or until cream cheese is melted and sauce starts to thicken, stirring constantly with whisk. Return chicken to skillet; turn to coat both sides of each breast with sauce. Cook 2 min. or until chicken is heated through. Sprinkle with parsley. If possible, use a large skillet with sloping sides when preparing this recipe. Not only does this allow you to easily turn the chicken pieces but the larger surface area speeds up the evaporation of the cooking liquids which, in turn, allows the chicken to brown more quickly. Stir 2 Tbsp. KRAFT Grated Parmesan Cheese or 2 tsp. GREY POUPON Dijon Mustard into cream cheese sauce before the final 2-min. simmer time. Prepare recipe as directed. Transfer chicken to serving platter, then top with one of the following options: Spinach-Bacon: Top chicken with 1 cup baby spinach leaves. Drizzle with sauce; sprinkle with 2 slices cooked and crumbled OSCAR MAYER Bacon. Tomato-Basil: Top chicken with 1 cup quartered cherry tomatoes. Drizzle with sauce; sprinkle with 2 Tbsp. chopped fresh basil.